MEGAMAX WELCOMES ITS FIRST MOBILE TOWER CRANE! With the purchase of the Liebherr MK88, the range within the group expands! This way we can continue to help our customers in the most efficient and economical way! A new rental company in Belgium, founded by three former employees of local crane rental companies, has invested in one of the first Liebherr's 250 t LTM 1250/1 units, featuring a 72 m boom. The new company is named Megamax and comprises a three-man management team headed by Kurt Buermans who is managing director. So far the company has a fleet of 15 cranes, all of which are Liebherr units, with the exception of two Demag city cranes. Kurt Buermans told IC that he will also be looking at investing in Tadano Faun cranes in future and said he aims to win business through a "back to basics" approach. "Let's stick to doing things we know, but do them better than others," he said. The lifting sector of all kinds has a bigger stakeholder and, moreover, is determined to become a major player. A goal perfectly within reach since the company Megamax is led by a triumvirate that can pledge more than 15 years of experience in the field. He is led by Kurt Buermans as Managing Director. Megamax was born in February in Feluy. It currently has a fleet of mobile cranes of 30 to 300 tonnes, 15 Liebherr and 2 Demag while planning to acquire Faun equipment. In the wake, Megamax has also received its first Liebherr 1250/1. a choice justified by a load chart comparable to the 1300/1 and a telescopic boom of 72 m.
The company offers an integral service, from the provision of additional equipment such as rolling plates, drag-line trays, spreaders, nacelles, skips and other walkie-talkies, to the setting up of signaling adequate, etc. All its projects are carried out according to the VAC standards while its engineering department can take care of the lifting plans, the risk analyzes and the other site data. Thanks to its flexibility and wide range of services, the company is obviously aimed at the construction sector as well as industries, telecoms, (petro) chemistry, steel, etc. 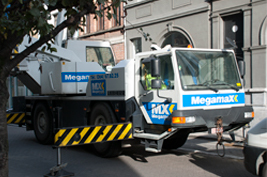 The new crane rental company Megamax was founded in February 2002 and has been active since May 2002. 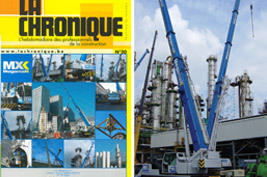 They have a fleet of 15 cranes with capacities between 30 and 300 tons. 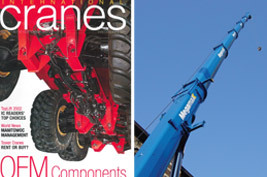 All cranes are from the brand Liebherr with the exception of two City Class cranes from Demag, an AC30 and an AC40. One of the first LTM 1250/1 from Liebherr was destined for Megamax with a main boom of 72 m. The company employs 22 people and is led by three people who have already earned their spurs in the crane rental sector, ie. Kurt Buermans, Philippe Vandenbranden and Luc Ceulemans. The company will be active throughout Belgium but mainly in Wallonia. The company is VCA certified and has Feluy as its home base. Megamax, a rental company of cranes with headquarters in the Walloon city of Feluy, will explicitly focus on the Limburg market. The company has just invested 4 million euros in new mobile cranes, which will be used mainly in Limburg (and Flemish Brabant). 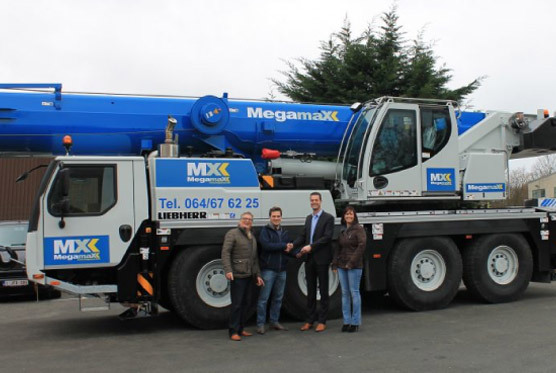 Megamax has strengthened its ambitions, opened a depot at the Handelskaai in Hasselt. With this investment, 6 new jobs are created. 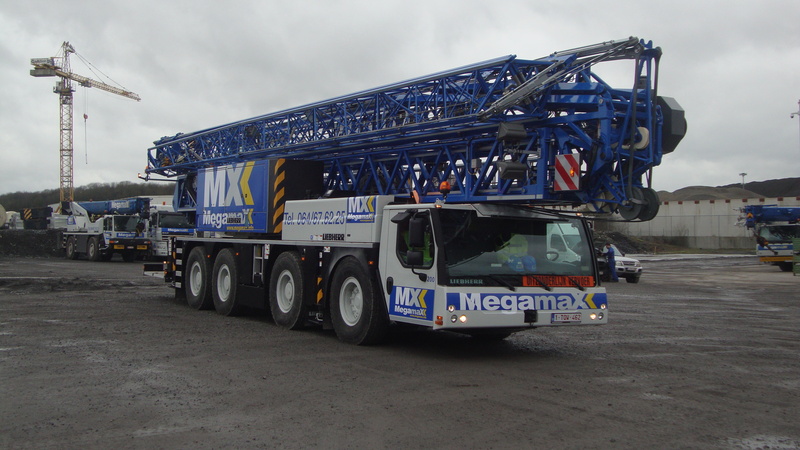 Megamax Limburg welcomed its seventh crane this week. This crane is a mobile copy with a lifting capacity of 70 tons. 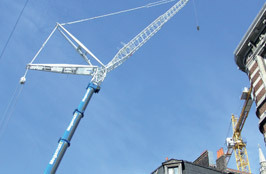 It is the first of 4 new cranes that are to reinforce the Hasselt fleet this spring. The total investment in Megamax Limburg amounts to 4 million euros. The supplier is Van der Spek (from Ternat). Megamax has been active in Limburg since June 2016. The management is satisfied with the start-up phase and therefore releases the budgets for further growth. Martin and Leonard Jacobs, who lead the branch, also announce the recruitment of 5 additional employees. This will bring the total to 13.